First you will need to make your cornets. This is usually a long, involved process that requires cornet molds. So we are going to cut our first corner right here by making our own cornet molds. Simply use your hands to shape tin foil into small cone shapes. I twisted the end (sort of like a carrot) to make for easy mold-removal later on. 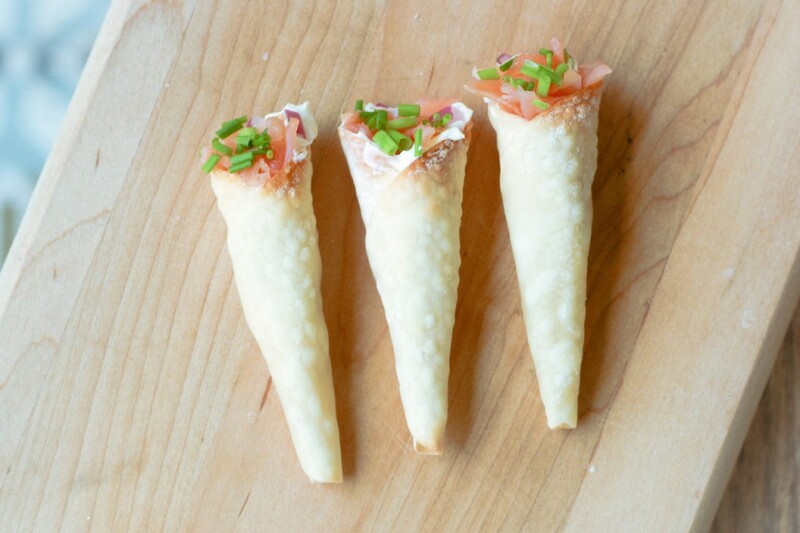 Our next corner-cutting step is to skip making our own cornet batter and just use wonton wrappers. You can find these in pretty much any grocery store with the Asian foods (in the refrigerated section). If they have gyoza wrappers, even better, because they are round. If you can only find square wrappers, cut them into circles with a cookie cutter or use the lip of a cup to mark the circle, then cut it out with scissors. Now wrap one wrapper around your mold, moistening the areas where it touches with a wet fingertip. Spray the wrappers with a mist of cooking spray, place on a silpat or parchment paper on a baking sheet and bake for 4-5 minutes, until just starting to brown. If you have black sesame seeds or poppy seeds, you could sprinkle them on before baking for a little added color. When done, let cool for a few minutes, then remove your molds to find perfect little cones. This looks so delicious that I have to walk away before I’m tempted to make (and eat) a hundred of them.